How fake does that background look? Readers around the world were taken aback by this page, in no small part due to Scientology’s extremely checkered history, particularly when it comes to the Internet. 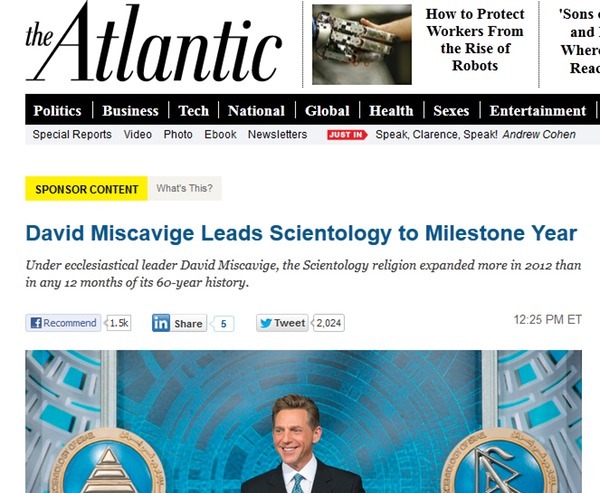 The content of the “post” was little more then a press release for Scientology wrapped up in the guise of an Atlantic article, and the indication of “Sponsor Content” was far from large. Far worse than the text of the post itself, however, was the comments section. Though they had an identical appearance to the comments seen on all other (non-sponsor) pages on TheAtlantic.com, these comments were heavily moderated, with only pro-Scientology comments being allowed. Simply put, the entire thing was an affront to everything for which journalism stands. Of course, with a simple spoof, The Onion has nailed it as usual.